Based on the fact that you are reading this page, we are going to make the brilliant assumption that you do, and therefore skip the theoretical debate as to whether they exist or not. So what exactly are ghosts? Well, this question is a little harder. The classic theory is that they are the essence, or spirit, of the deceased. This definition does fit some haunting situations nicely, but definitely fits rather awkwardly into many others. If they are the spirit of the deceased, do they have free wills to do as they please? In many cases, the short answer appears to be NO. Ghostly apparitions are often found mindlessly repeating the same task over and over, as if stuck in a time warp. Such cases definitely do not fit the cut and dried definition of a "ghost" as being the free spirit of the deceased. Battlefield reenactments are classic examples of this. Another theory is that apparitions are made up of some type of finite "energy". There are many well-documented cases in which they are observed to actually fade out with time, as if their energy is slowly being depleted. For example, a female is seen wearing a royal blue dress, which over time fades to light blue, then to white - finally she is reduced to a wispy figure, and then she is gone, never to be seen again. 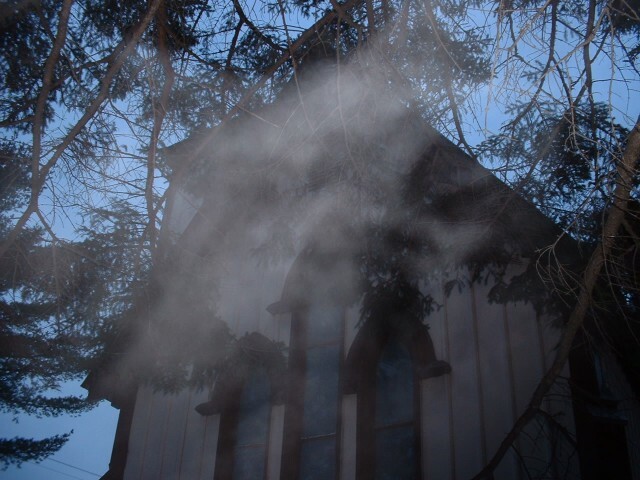 There is also a school of thought in which certain places are energy trappers, with buildings, trees, or what have you in just the right configuration for the appearance of apparitions, and these are the places that are known hot spots for ghostly activity. Please see Other Dimensions for a possible explanation for this interesting phenomena. For more complete information on what we do know and the prevalent theories regarding the origins of ghostly phenomena, please see The Nature of Ghosts. So the long answer to "What is a Ghost" is that each individual case has to be judged on it's own merits. In many cases where the apparition seems lucid and thinking, it may be that they are living in another dimension side-by-side with ours, and either they or we are finding the doorway through. In other cases, it may be that some kind of energy has become stuck, possibly because of the configuration of the surroundings or because the spirit is trying to put closure to something important to them. Lastly, in some cases, it may be that the deceased doesn't know they are deceased, or they have something important to contribute before they move on to another plane. Whether we will all have an opportunity to haunt the earth after death is a question that cannot be answered until we breathe our last breath. It appears, however, that everyone doesn't get this option, or if they do, their energy or essence is so weak that it can't be detected. This section of Mystical Blaze is devoted to the theory and various forms of ghostly apparitions, and it is a work in progress, so please do Bookmark and return often, as we update these pages daily. Lastly, if you have experienced unexplained phenomena in any form, we urge you to contact us. We will use every resource to try and help you if this phenomena is troublesome! Use the Message Board below, or contact us privately via E-Mail and we will respond as soon as possible!